The DB2 production car was first shown during April 1950 at the New York Motor Show, a fitting event as British manufacturers were strongly encouraged to export as many cars as possible. Demand was incredibly strong yet Astons were not able to build cars fast enough. The success of the team cars during the 1950 Le Mans 24 hour race (hastily snatched from the production line) will certainly have made the DB2 a more attractive car to the post war sporting motorist. Fine car though the Aston Martin DB2 was, its sales had been affected by the limitations of two seats and minimal luggage space. Aston Martin thus re-designed the rear of the car to enable two occasional rear seats to be installed and at the same time raising the roof line slightly to increase headroom and fitting a larger rear window in an opening lid. As such, this Aston, appropriately renamed the DB2/4 was arguably the world’s first hatchback. The windscreen also became a one-piece moulding, the quarter light windows were reshaped~ headlights repositioned higher in the bonnet and the overall length increased by six inches. Beneath the aluminium body the rigid steel chassis retained its independent trailing link/coil spring front suspension with transverse torsion bar, a live coil-sprung spring rear axle located by parallel arms and Panhard rods. Brakes were large and powerful drums all round. 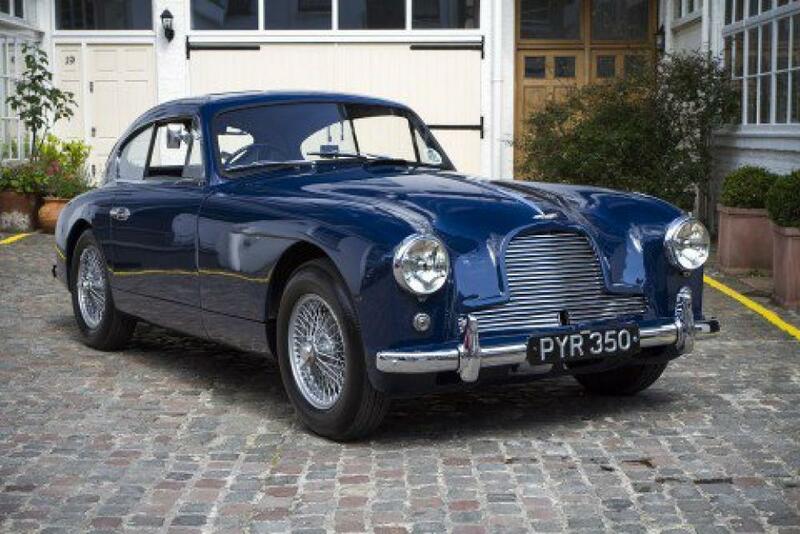 The DB2/4 made its debut at the 1953 London Motor Show and met with considerable public acclaim. Our car # LML948 was supplied new on the 14th May 1955 to a Mr R Martin of Cirencester, Gloucestershire; purchased through Brooklands of Bond Street, London. The car was then sold to a Mr. H.S. Short via Short Bros of Sunderland. Mr R Craven then bought the car in November 1962, who raced it at Brands Hatch for the AMOC meetings in the 1960s. The car then passed ownership again to Mr A Wolstenholme of Watford, Hertfordshire. The custodians of a long term family ownership of the Aston Martin were Mr Geoffrey & James Stevens whom had the car for some thirty four years. The last keeper, Mr M Bock, whom acquired the car in 2006 carried out restoration works that included an engine rebuild with new cylinder head, crankshaft, conrods, camshaft and pistons, new brakes, new clutch, lightened flywheel, replaced differential and serviced driveshafts by specialists Andreas Fojtik in Austria. Total works were in excess of £50,000.00. The comprehensive history file accompanying the car also includes various invoices by Aston Martin Service Dorset dating back to 1973 and MOT’s to 1983. Presented in Warwick Blue with Blue hide and retaining its original registration number PYR 350.